Whimsical gardens and water features have become an all consuming hobby. The Fence that made good neighbors,,,sort of. We had planned from the beginning to fence our property so we discovered not only do we need a permit but that they would be inspecting the fence also. I am sure every county has rules as did ours. After discussing it with a plant and wildlife enthusiast friend of mine she convinced us to make sure it was wildlife friendly. That meaning bugs bunny and turtles would be able to pass through. At the time I thought that was the way to go so I convinced hubby and we went with Hog wire fence with about 4"X4" squares. The neighbor behind us had been warned that we would be putting up a fence when I noticed after the survey that he had been planting things on our property. He actually got angry saying that he had used that property for years! Well, the folks we bought it from had not spent any time in the back of the property and there were alot of trees sheilding their view. I tried to be nice saying, just come over and dig your plants up before the fence goes up. Time went by and he did not do a thing. 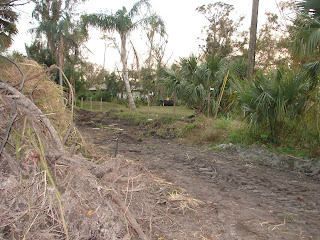 We would have started the fence sooner if the first pond guy had gotten the work done but we had to wait for the area to be cleared of invasive Australian Pine trees. my landscape man around telling him to dig up his trees and plants and put them on HIS property." WHOA," I said. " I am NOT paying him to do your work nor will I let him go on your property because if anything goes wrong you will sue us!" 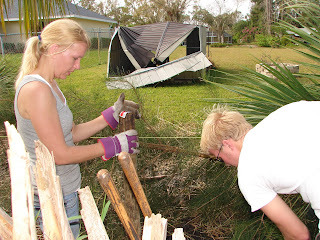 At that we began to make plans to rush the fence and start it in the morning with one son and our daughter to help us. 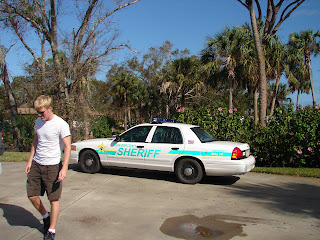 That is all it took for me and the NON emergency Police number was called. Now that we hired the new pond man we could only hope for the best. I'll never forget as he looked over our property piled high with mangled trees and mounds of sand and other debris. "I am ONLY doing this because you are such nice Christian people" he said. "Normally I do not clean up after another guys mess and try to make something of it!" He also warned us it would not be cheap. But we could live with the mess no longer so it was time to get it complete. He got right to work hiring other men and bringing in his equipment. He even gave the grandkids a ride on some of the big stuff. I insisted the ponds be natural looking and the creek meandering. It seemed foreign to them that someone would not want a round pond and a straight creek. I actually had to walk the outline so they understood. But he and his crew got busy cleaning up and digging. It was done in a week we could not have been happier. Well yes we would have been MUCH happier if he had been there to do the pond build originally. 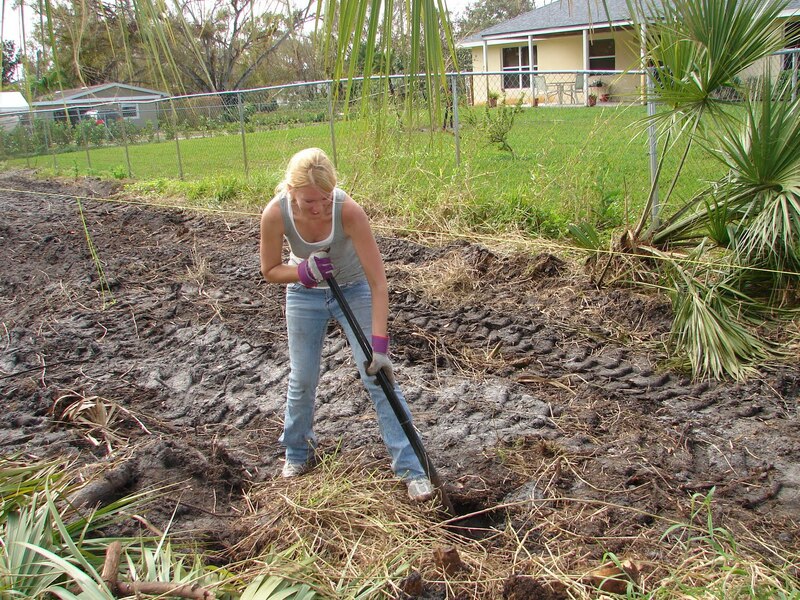 drainage easement she sang a different tune, thanking us for putting up a fence. A few acres to garden close to town was our dream come true. As a Master Gardener I couldn't wait to start planting! But before we could close on the house and property hurricane Francis and Jeanne devastated the area. 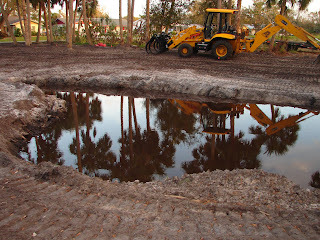 We looked at the swampy mess with trees down, giant holes full of water where the roots of majestic old trees had been. 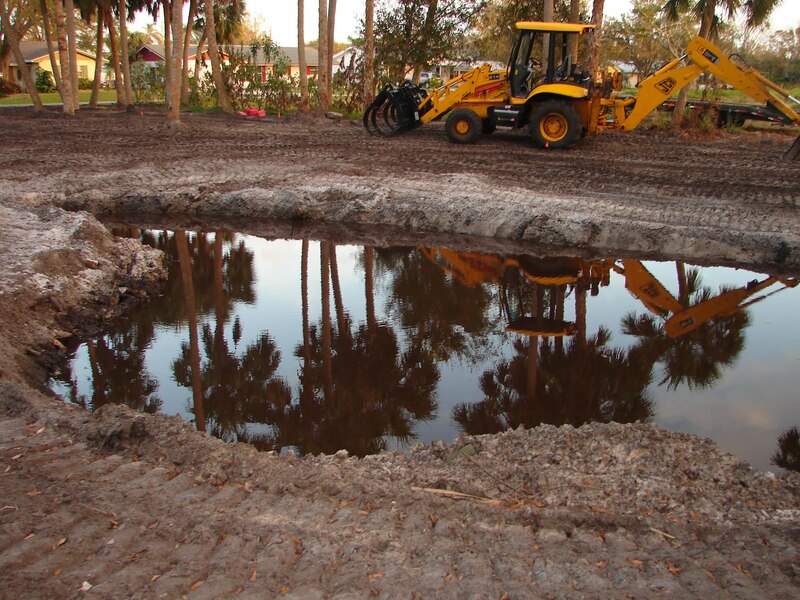 My sweet husband shook his head at a water filled hole, "I think we should tear up the contract" he said sadly. With a glimmer of hope I smiled and said,"I see PONDS!" and so began our ponding journey!